RAIL Back On Track (http://backontrack.org) a web based community support group for rail and public transport and an advocate for public transport passengers has often called for concession fares to be made available to the unemployed in Queensland. Queensland ALP now have extending concession fares to the unemployed as part of their policy platform. "Queensland is the only state or territory in Australia that does not extend concession fares on public transport to the unemployed (1)." "For south-east Queensland this is a vicious double whammy for these disadvantaged citizens. Fares in south-east Queensland are amongst the worlds most expensive, particularly paper tickets. How are the unemployed expected to be able to attend job interviews, get out and look for jobs if they are unable to access public transport?" "Fare box wasted on go card rorts by the cashed up 'suits' could easily be redirected to providing concessions for the unemployed. It just takes a bit of wisdom and political courage to fix the failed fare structure in SEQ (2)." "We welcome the committment by Queensland Labor ' ... will maintain public transport concessions and extend them to recipients of the Newstart allowance ' (3)." 2. Do you support daily/weekly capping on go card (or equivalent) ? Queensland distinguishes itself as the only state that does not offer concession fare on public transport to the unemployed. 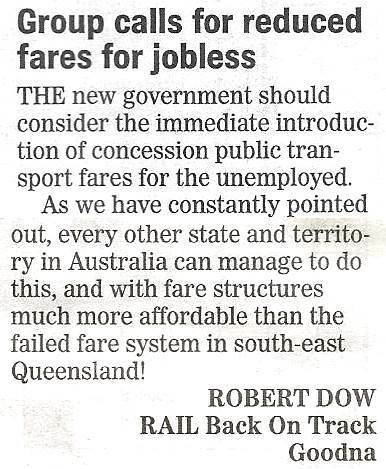 For SEQ this is a very serious issue as fares on the TransLink SEQ network are amongst the expensive in the world. Other Australian jurisdictions with much more affordable fares also give the unemployed concession fares. This helps in their job seeking and social mobility. This morning the Ipswich Queensland Time is reporting that the unemployment rate in some suburbs is up to 23%. This devastating of course. Little wonder that serial fare evasion is a chronic problem in SEQ. Forcing the unemployed off public transport just compounds the problems, social, economic and moral. The new government should consider the immediate introduction of concession public transport fares for the unemployed. As we have constantly pointed out, every other state and territory in Australia can manage to do this, and with fare structures much more affordable than the failed fare system in SEQ! We welcome the committment by the Deputy Premier and Transport Minister Ms. Trad for a fare review given yesterday during media. We note the positive comments by the Deputy Premier on the need for full and proper community consultation. However, we believe that concession fare entitlement for the unemployed should be rolled out immediately pending the outcome of the fare review. It is after all Queensland Labor policy. Queensland is the only state/territory that does not offer concession fares to the unemployed. In view of the high cost of fares in SEQ this is a serious impediment to the unemployed having mobility. It works against their ability to find employment. Simply allowing the unemployed to obtain a green concession go card and showing their health care card as the entitlement is a no-brainer. It can be implemented overnight. What would it take to get you on a bus to train? Price changes and concessions for the unemployed are some of the ideas being proposed for the public transport system. Robert Dow is from Rail back on track, a public transport advocacy group, he says a public transport review needs to happen sooner rather than later. Deputy Premier Jackie Trad is the Minister for Transport - she says the terms of review are not yet finalised, but the review will be completed in next 12 months. Will the state budget finally see a roll out of concession fares to the unemployed in Queensland? Despite being Queensland Labor policy to do this we are still waiting. Queensland is the only state/territory that does not give concession fares to the unemployed. This compounds in SEQ of course as we have one of most expensive fare systems not only in Australia but globally. High cost fares for a poorly connected public transport network. Fare reform for SEQ, bus network reform for Brisbane is urgently needed. Will we finally see some action? The Palaszczuk Government is focussed on ' jobs '. I am sure we are all warm and fuzzy about that hey? But reflect on this for a minute. Unemployed in Queensland are denied concession fares on public transport. In every other State and Territory unemployed do get concession fares, not in Queensland though. This is particularly difficult in SEQ with a very unaffordable fare structure, so in fact is a double whammy. Constant feedback and observation over a long period have confirmed what a real struggle it is for the unemployed to get out to interviews, job searches etc. as the fares are very unaffordable. It has been ALP policy to give concession fares to the unemployed in Queensland since September 2014 (1). If the Government was actually fair dinkum about ' jobs 'this would have been one of the first things delivered on assuming Government. No, still waiting. The Fare Review, which once offered hope to sort out the festering fare failure in SEQ is stalled, along with concessions for the unemployed. It is little wonder that Labor is increasingly on the nose. They have abandoned the very people who voted for them in hope of some improvement! Once bitten twice shy hey? > http://railbotforum.org/mbs/index.php?topic=10966.msg174108#msg174108 … #qldpol where is the fare review?